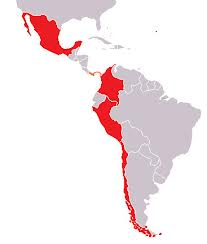 This week I take a snap shot look at relations between China and the countries on the west coast of South America, which have worked together to create a partnership called the Pacific Alliance, with the aim of creating a common economic space, to further free trade with a clear orientation towards Asia. Chinese oil firm Sinochem purchased Colombian based oil assets in 2009 and is increasing the production with a view to supply China. In the opposite direction Chinese textiles manufacturers have undercut local producers, causing a great deal of anxiety among local producers, notably through the supply of the famous national symbol a black-and-white hat or “sombrero vueltiao”, traditionally made in the village of Tuchin. A Chinese copy can be brought for $10, while the original home made version is $20, the danger to jobs and national culture these imports pose is causing anti-Chinese sentiment to rise. Colombia has been the subject of much speculation in recent years as the Chinese were reportedly considering a “land canal” – a rail route to connect the Pacific and Atlantic Oceans in order to bypass the Panama Canal. Apart from the high cost and practical implications, the idea seems to have been superseded by plans for a Chinese backed Nicaraguan Canal. Colombia has also started a more assertive foreign policy, in no small part to its improved economy (now the second largest in South America after Brazil, although Argentines might dispute that) setting a small development agency to help assist its poorer neighbours and allow them to learn from the Colombian development experience via technical cooperation projects. Chile has been a major beneficiary of the Chinese driven boom across the Pacific Rim. Demand, primarily from Chinese factories and construction for its huge copper reserves has help drive the economy to new heights. Chile also has plans to become a tech hub, investing in an incubator programme for young entrepreneurs from around the world, in an attempt to become South America’s answer to Silicon Valley. Utilising funds from the mining industry, the government plans to invest $40 million by 2014 in start-ups, in an attempt to move away from a dangerous over dependence on commodities such as copper and coal. Chile has also sought out new Asian partners, such as India and Indonesia, an indicator perhaps that these regions will have much stronger ties in the future. The Chilean wine industry is particularly well placed to take advantage of growing Asian demand for its reknowned Cabernet Sauvignon and Merlot, sales have soared in recent years – Chile is now the world’s seventh largest wine exporter. Sino-Mexican relations have taken off in recent years; bilateral trade has soared, but is heavily in China’s favour. Chinese exports to Mexico topped $50 billion, while only $6 billion went in the opposite direction. This could change as the price differential between Chinese and Mexican manufacturing has significantly shrunk, meaning that factories in the Latin American state will be much more competitive, and will be at a major advantage in selling to its giant northern neighbour. Mexican companies have also invested in China, the bread making company; Bimbo successfully moved into China, sincizing its products, adding ingredients such as red beans and beef to make them more palatable to Chinese tastes. Next Next post: Where Do Blood Diamonds Come From?